The Los Angeles Jr. Kings have announced the field and schedule for their 39-team Thanksgiving Weekend Extravaganza Tournament, which will run from Nov. 22-25 at three Southern California facilities. 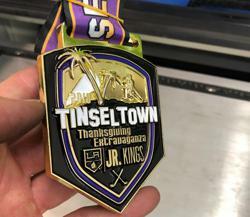 The Los Angeles Jr. Kings have announced the field and schedule for their upcoming Thanksgiving Weekend Extravaganza Tournament, which will run from Nov. 22-25. Thirty-nine teams from Northern and Southern California will compete in seven divisions: 14U AA, A and B; 12U AA and A; and 8U A and B. Games will be contested at Toyota Sports Center (El Segundo), East West Ice Palace (Artesia) and LA Kings Valley Ice Center (Panorama City). Division champions will be awarded a banner, and all players on the championship teams will receive medals. Players on the runner-up teams in each division will also receive medals. Tournament vendors will include Northwest Designs of California, Origami Owl, Aufeis Hockey, Custom Sports Banner, Teammate Robotics and Quality One Engravers. During the event, the Los Angeles Kings will be set up with a pro stock equipment sale outside of Toyota Sports Center, and the LA Lions will host a bake sale fundraiser inside the facility. Kings Cove, Grimaldi’s Pizzeria, Mendocino Farms and Tin Roof Bistro will serve as restaurant partners for the event, and PSE Event Housing successfully coordinated all hotel accommodations for out-of-town teams visiting over the weekend. All 14U and 12U games played at Toyota Sports Center will be streamed live via the Internet through LiveBarn.com.